I am a photographer and research scientist specializing in insects, especially ants, but also beetles, bees, wasps, and various other arthropod curiosities. My scientific background is in systematics, a broad field that includes the discovery, description, and classification of life and the inference of evolutionary relationships. Unless otherwise indicated, the photographs appearing on Myrmecos blog are my own, and they are available for commercial licensing. Educational and selected non-profit use is strongly encouraged and free of licensing fees. Please contact me (alwild [at] myrmecos.net) with questions about image permissions. Wild, A. L., and I. Brake. 2009. Field observations on Milichia patrizii ant-mugging flies (Diptera: Milichiidae: Milichiinae) in KwaZulu-Natal, South Africa. African Invertebrates 50: 205–212. Wild, A. L., and D. R. Maddison. 2008. Evaluating nuclear protein-coding genes for phylogenetic utility in the Coleoptera. Molecular Phylogenetics and Evolution 48: 877-91. Roura-Pascual, N, A. V. Suarez, C. Gomez, P. Pons, Y. Touyama, A. L. Wild, A. T. Peterson. 2004. Geographic potential of Argentine ants (Linepithema humile Mayr) in the face of global climate change. Proceedings of the Royal Society of London, Series B 271:2527-2534. Just wanted to say you’re making great pictures… thanks for that and all you’re explantions on this website! I’m an ecologist working in New caledonia and i’m finding wonderful the fact that biologist like yourself, are kin in sharing their knowledge. Hello Jake- send me an email (alexwild -at- email.arizona.edu, but replace the “-at-” with @). As an entomologist and photographer, I appreciate your beautiful macro images. I just discovered your beautiful informative blog today (13 Sept 2008). I have been admiring and to a little extent harvesting your superb photos for some time. As a quick question – how do you identify your species? Do you make use of my “Ants of Africa” website and, if so, have you encountered any problems, etc. I spend most of my otherwise “retired” time trying to add to and improve the website and any feedback will be very welcome. I am sorry my pictures don’t achieve the beauty of yours but I do try to make sure they are fit for purpose. Hi Brian. Thanks for your kind words. I’ve been aware of your web page for a long while, but I’d not used it because I’ve not spent much time in Africa. Wow, though. I can’t tell you how useful it has been with the material from my recent trip to KZN. Everything that has a name on it went through your keys to get there. You’ve assembled an amazing resource. I’ve been meaning to blog about it, perhaps I will soon. You’re more than welcome to poach any of my images for your site, by the way. But I love your site!! I am convinced that people will view ants, and other tiny creatures, much differently after seeing macro images like ours. When you can see a creature’s eyes, you know there’s a mind in there, and you may just find it impossible to callously step on a bug ever again. Your work is inspiring! In case you’d like to see the results of your influence, here are the images I took on my first ant photographer foray. These images simply would not have been possible without your guidance. These images represent some of my proudest moments in photography. Thanks again. Thanks Scott! Your images look great- very crisp. I really love your blog, your photography and all the fascinating information that you present. You successfully show the world how amazing and beautiful the insect world is. Imagaine how surprised and honored I was to come across your October 28th post… gosh. thanks! I’ve just read about Marialis on Panda’s Thumb and have a question. If I interpret it correctly, your cladogram shows Martialis to be the sister group of all living ants. Since it was blind and many living genera are not, that presumably implies that vision evolved independently within modern ants. I would therefore expect there to be some significant differences between modern ant eyes and those of other hymenoptera. I assume I’m missing something. It is just amazing the number of people interested in insects and taken pictures of them plus it makes very interesting reading. Have you heard about this book? i work for a local pest control company here in del rio,texas. we have had three confirmed cases of rover ants in our area including one case being in our hospital. confirmations of the rover ants was given to us by mississippi state extension service. Recently, I found your fantastic site and I was absolutely stunned by the beauty of your ant photography! The fact that you also share your information as to how you photograph these tiny critters is also wonderfully gracious. I have begun helping David General and Lynne Thompson here in Arkansas with their newly instituted study of Arkansas ants. What fabulous creatures these are! Continued good luck to you with your fantastic photography and your ant research. I live in Arkansas and enjoy ants. The internet has helped me greatly in ant identification. I greatly enjoy my Atta septentrionalis and Labidus coecus. I hope that I have identified them properly. I enjoy watching them in my homemake formicariums with tubes for them to run in. Do you keep ants or just identify them? I am curious. I don’t get a chance to meet or talk with anyone in the area that is interested in ants. I am interested in purchasing an affordable time-lapse video system for recording insect behavior (such as foraging, response to chemical exposure) during day and night. Anybody has recommendations? Fantastic pictures! I came here hoping to find a decent picture of Rhytidoponera metallica as I was recently bitten by one of the little buggers in my front yard (I live in Brisbane, about 2kms away from where you photographed your specimen). It’s been a few months since I was last bitten, but each time it astounds me how much pain such a tiny creature can inflict! You are a biologist at the University of Illinois? Wow, I think I am going to U of I at Urbana Champaign for engineering in the coming fall. I hope I would meet you there. Somehow I got obsessed with ants about a year ago. 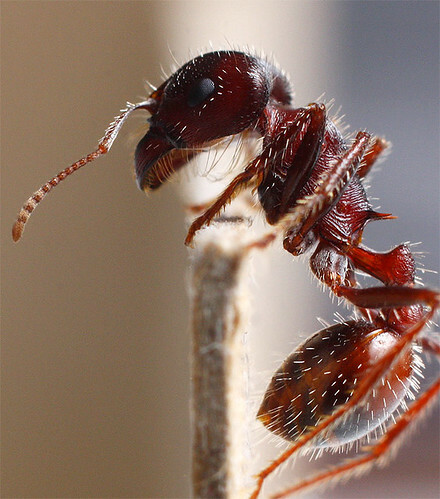 However, because of school and the cold winter, all I could do was reading and looking at pictures about ants online. I hople I could learn more from you. Would you please email me if you have time, I have some questions about ants. Thanks! Could you please provide me some paper reference about bio-energetics of leaf-cutting ants of South America (Atta sexdense). I am a big fan of animals and i just wanted to know something about some animals like how do some animals make like six babbies all at once and we humans just make one babby at a time? Hey, Alex, I love seeing your photography. 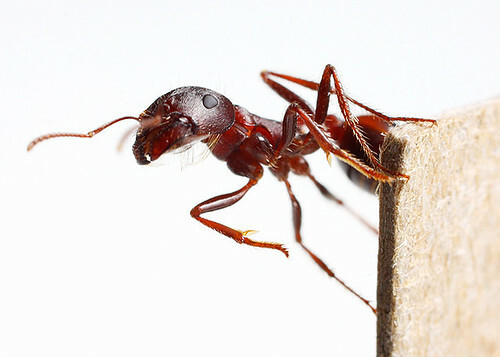 I’m a fan of E. O. Wilson and in some of his books I saw very amazing ant photography. I don’t undertand why the ScienceBlogs overlords shunted you off; you were presenting some great photos and commentary! Thanks Larry. Photo Synthesis was envisioned as a rotating blog when it was created, and I served the regularly allotted time. I’m glad it was only a month, too, because I burned through 2 years of my best material in 4 weeks and there’s no way I’d be able to maintain that level of quality over a longer period. I’d be down to poorly-exposed photos of lint, or something, after a couple months. All the same, they didn’t really “shunt” me off- I’ve got a standing invite to move Myrmecos over to the SB network. At some point I may take them up on it. well, I just have to say “Hello”, because I clicked on the taxonomy tag inside my dashboard and I landed on your post regarding the bumble/honey bee debacle. Lo-and-behold, you are in Urbana, my hometown…. born and raised. (now live in the hot sweaty south, though being near the coast gives ample opportunity for finding wildlife that I didn’t get to experience in Busey Woods)…. I am a little science wanna-be, studying pre-med/bio… recently discovered the excitement of hunting snapshots outdoors, now that I’ve been spending hours pouring over my bio text and lab. i will definitely be returning to your site! 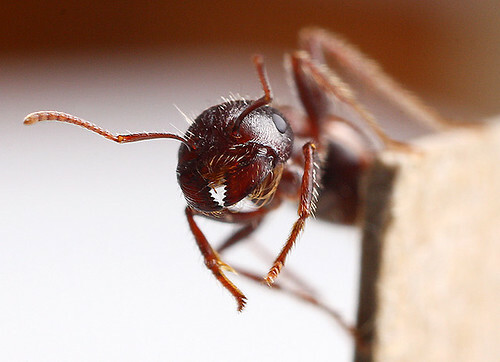 I wonder if you could send me information about ants and researchers in the area of Myrmecology, or even information on internships. Forgive my English. And, of course, sincere congratulations on your wonderful work! Some collegue told me recently that you were blogging, I think I’ll follow it closely, it’s good to stay in contact with some ant mafia people… And just so you know my support, I think blogging about research is just another way to conduct those so important hallway or coffee discussions without paying for a plane ticket – good for the environment. hola mi nombre es wilson hernandez soy es tudiante de biologia hace 4 años estudio las hormigas de colombia yo contruyo hormigueros artificiales para hormigas pero tengo un problema grave i es la calidad de mi fotografia tengo una camara y esta camara pues no es muy buena es una cannon a 550 o mas bien no esta diseñada para tomar estas fotografias e ahorrado un dinero es mas bien poco muy poco quisiera que me aconsejaras alguna camara economica que me sirva paraa tomar buenas fotos. Your photography is an inspiration! Mb’echepa – I was a Peace Corps volunteer in Canindeju in 1998-2001 and just wanted to say hello. I believe you were the apiculturist in Once de Septembre? I was in Villa Ygatimi. I now work for the Wisconsin Dept. of Ag and noticed your photos in our Pest Bulletin and thought I would say hello. Just discovered this site. It is very nice. I have listed your link on a website I am developing at http://www.lifeatdrtoms.com, but you might check out my light-hearted blog listed in box above. Wasn’t sure where else to put this. I have been getting the skeleton from a dead bird with the help of Australian green tree ants and they have been doing something very peculiar to me. The bird, which is in a container, is often suspended from the top by the ants. I wrote a blog post which includes some photos of it. I was curious if you could help me understanfd why they are doing this? These macros are fantastic! What camera and lens do you use? Is there any photoshopping to splice images together? Thanks! 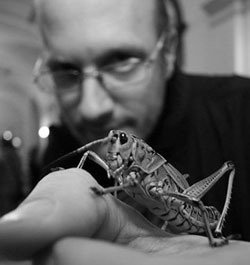 Alex, thank you very much for sharing all this wonderful entomological information and beautiful pictures. 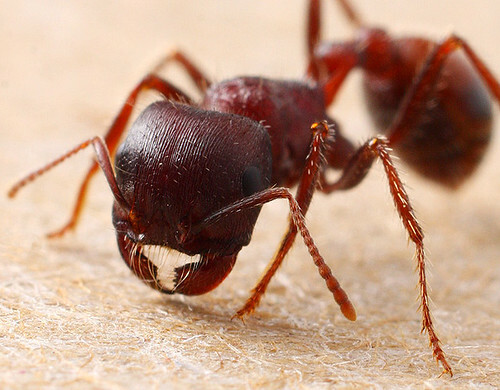 I was always fascinated with insects, got to meet with gentleman named Dr. Frank King back in the early 70’s in Gainesville Florida – he had made large scale models of fire ants, I wish I had pursued insects now… even more. Great stuff, you are going to kill a bunch of my time here. just discovered your blog via Boing Boing and having lots of fun going through all your beautiful photos! thanks and will be checking in regularly! 1) I uncovered a small colony of the large ant in sandy soil under a pile of crushed rock (driveway type). I placed maybe two spoonfuls of dirt in a cup and upon examination discovered that there were two species living together (my assumption). If not together, they live within a quarter teaspoon of each other. 2) Any suggestions on simple references for some basic ant identification? I live in Gila, New Mexico. 3) Any suggestions where I can purchase a better mm ruler for scales purposes? The blog is usually interesting. dear alex,I fotografed one ant in my country (Portugal) in dunes (coast).I do not know if they are Linepithema humile or whether other species. can you help me. I am enjoying thoroughly your Mymecos Blog and am learning tons about macro photography. On the old blog at mymecos.wordpress.com I watched with much interest the video clip by Attenborough in Planet Earth where he featured the Cordyceps killer fungus. I’m puzzled by a bug I shot recently which looks rather odd with something projecting from its back and wonder if it could be a killer fungus. The image is at: http://www.pbase.com/skhin/image/143573254.